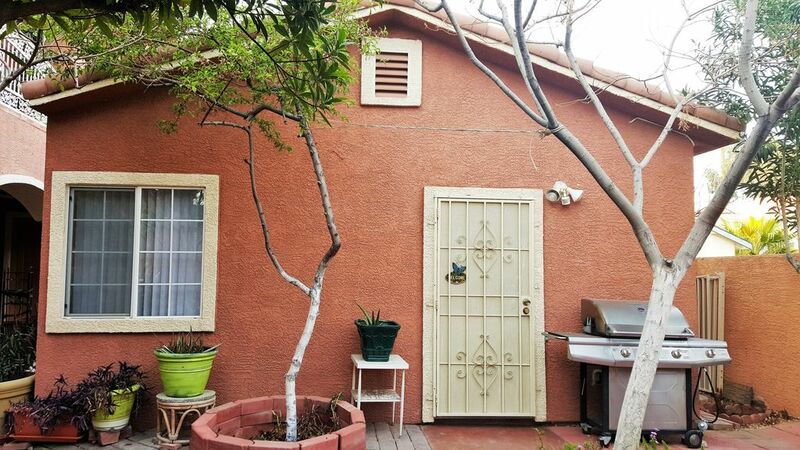 If you’re looking for a clean vacation home near the Las Vegas strip for cheap look no further. This newly built luxury apartment is a 1 bedroom with a queen bed, 1 bathroom, kitchen, dining area, and comfortably sleeps up to 4. It is located in a private cul de sac. There is a driveway where you can park your vehicle safely. We can add roll out bed per request if you have more guests. Also has TV, washer and dryer. Everything you need; plates, silverware, shampoo, towels etc. The desert style landscaped has tables, chairs and BBQ grill. It is a friendly neighborhood that is 3 min from McCarran Airport, 5 min from the famous strip, Mandalay Bay Hotel and Casino, Luxor, New York New York, MGM Grand, Excalibur, Cosmopolitan, Vdara . 12-15 min from Fashion Show mall and convention center. Fremont Street Experience, SLS Hotel and Casino. **STATE ISSUED I.D. OR PASSPORT IS REQUIRED UPON ARRIVAL. IT NEEDS TO MATCH THE NAME ON THE RESERVATION. **ALL CANCELLATIONS WILL BE A $150 USD FEE ASIDE FROM VRBO SERVICE FEES. I also have other properties, if this isn't fit for you please let me know and we can work on finding something that works for you. Very nice unit but geared more for young folks. If I were the owner I would put in a smaller kitchen table n chairs n a more comfortable couch with a small coffee table to put a coffee/ drink on vs a futon which we (over 50’s) four days uncomfortable. If i was 30 it would be fine. We were very pleased with the space. It was clean and easy to get in and out of the unit. Overall, very pleased! Very clean and beautiful property. Place was quiet and is in a safe area of Vegas. We will be coming back again soon! the place is clean and neat, we have a really good time, I will definitely going back. the landlord was very nice. I was recently in Las Vegas on business and stayed in the Lacotacina for 4 weeks. It was a comfortable place and the owner was friendly and accommodating. I would stay there again. We are a family of four (two adults two youth 22 & 19) and stayed at this location to experience Las Vegas New Years Eve. The owners were very attentive to our requests. Facilities are quite new with high end materials used throughout and various sleeping configurations depending on number in the party. Living quarters and suites are located at the back of a suburban house minutes from the Strip and Airport. We did a lot in the three days we were there including hiking in Red Rock Canyon. Thanks.